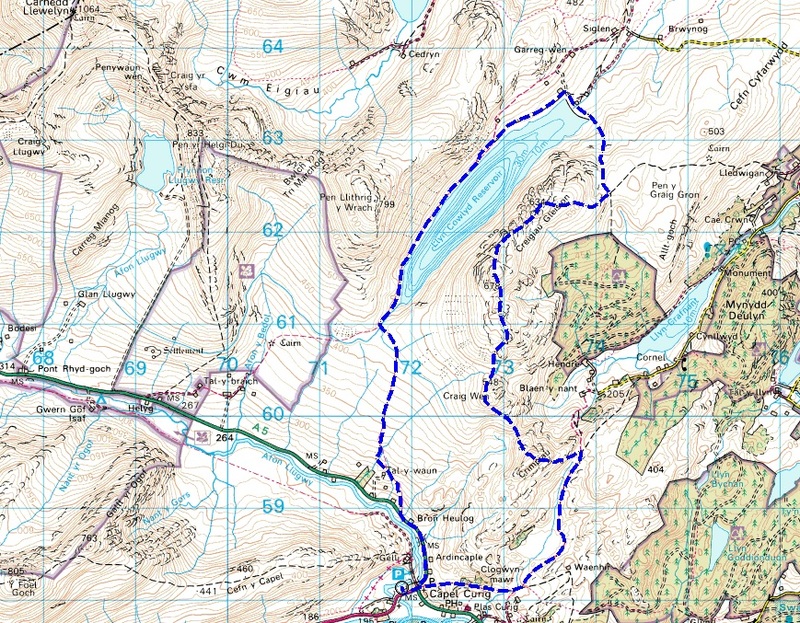 Our short outing onto the north-western hills of the Carneddau (see post #172) had the feel of a spring day about it, and with a few more days of settled sunny weather on the way, I decided to make the most of it by re-visiting the route I had abandoned three months earlier in the gales of December (see post #165). 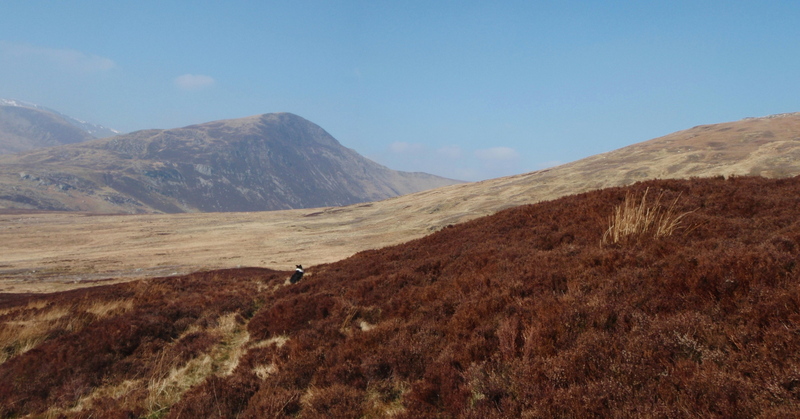 So, the next day I was at the south-east of the Carneddau range, ready to have a crack at Creigiau Gleision again. 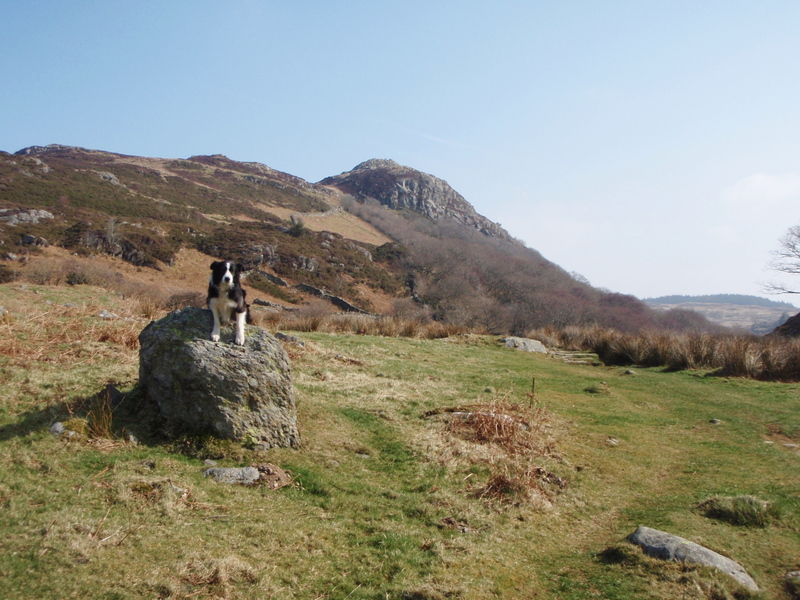 I set off from Capel Curig with my regular walking partner, Border Collie ‘Mist’. 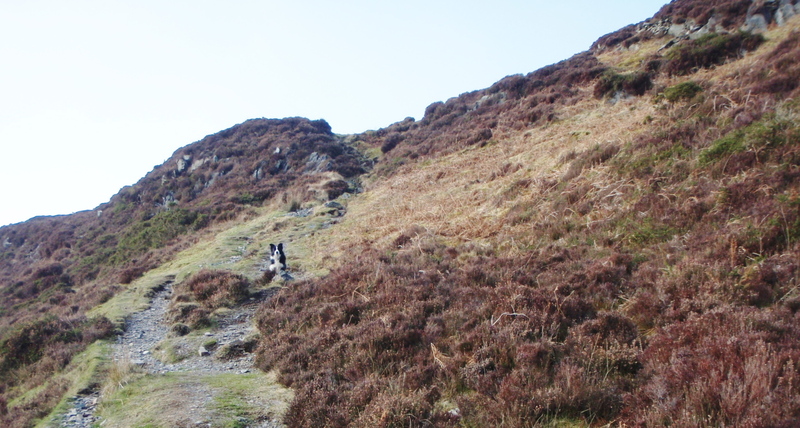 Dogs make easy walking companions – they don’t complain, don’t ask for the map, don’t suggest that you have taken a wrong turn, and ‘Mist’ is no exception. 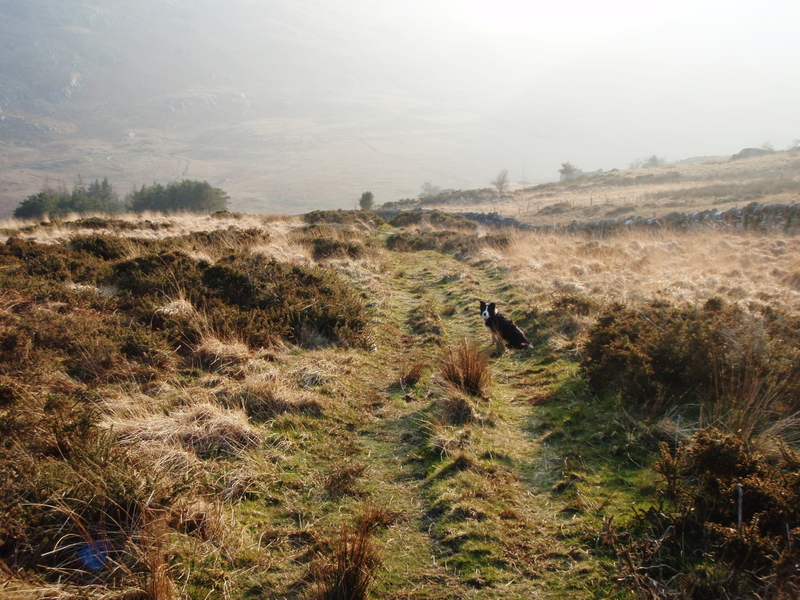 She is also stock trained, and ignored the new lambs in the fields as we set out towards Llyn Crafnant. The way is gradually rising at first, but before Llyn Crafnant it takes a turn uphill to Crimpiau, the first summit of the day. 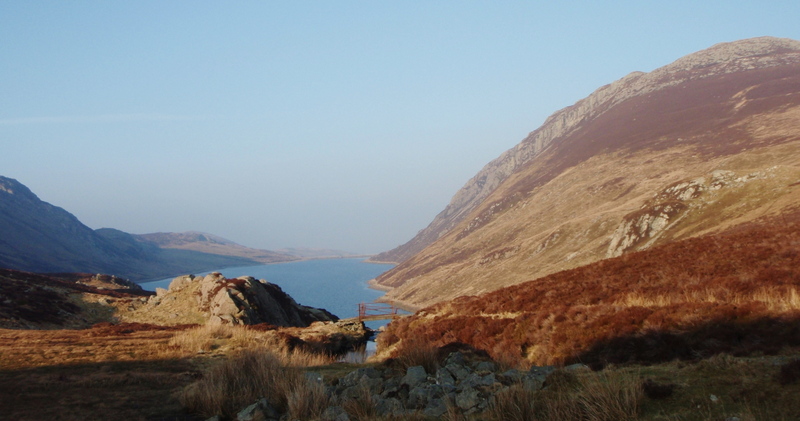 Looking back to Craig Wen …. 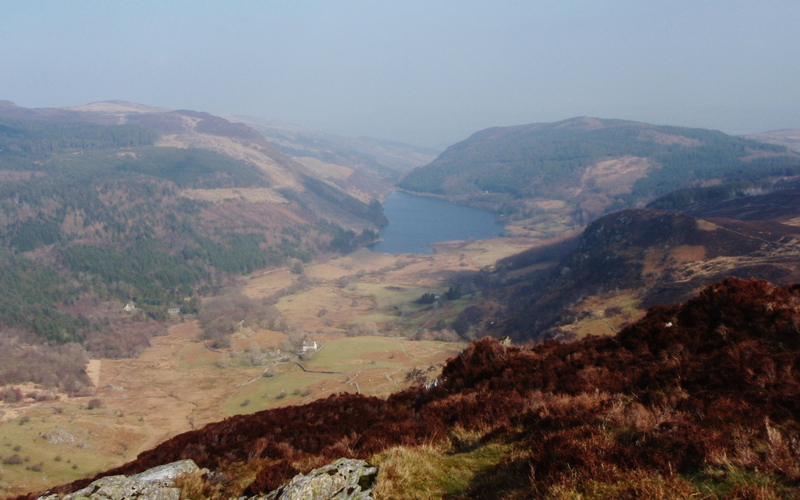 Although low in altitude, Crimpiau is a great viewpoint, and from the top I could see the next peaks of Craig Wen and Craiglwyn. I didn’t bother with the summit of Craig Wen this time, but as I came round the shoulder of the hill I had a great panorama of the mountains of the southern Carneddau stretched out in front of me. 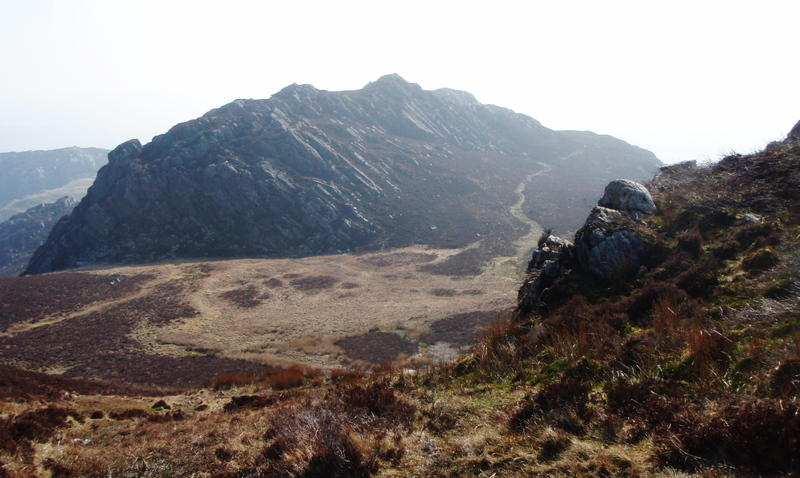 The nearest hill was Pen Llithrig y Wrach, which translates as ‘Slippery Hill of the Witch’ (see post #77) – what a great name for a mountain! Craiglwyn had been the furthest point reached on the aborted December trip, so from there on I was on new ground. The high ground of Craiglwyn and Creigiau Gleision gave great views across to Pen Llithrig y Wrach, including my route back along the shoreline of Llyn Cowlyd. Just before the summit of Creigiau Gleision I came across an amazing band of pure white quartz, and ‘Mist’ obliged by posing for a photo to give an idea of scale. 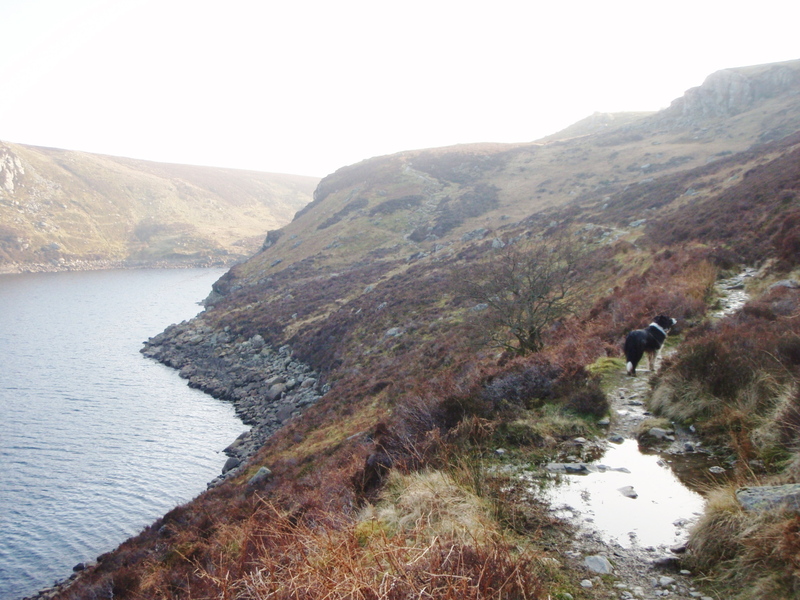 Before long I had crossed over the summit and was heading down to the dam at Llyn Cowlyd. The walk back above the lake gave great views back to the high route I had just taken. Before long I was contouring round the lower slopes of the witch’s slippery hill, to cross the pass at Bwlch Cowlyd, where the final views of Llyn Cowlyd completed a great route. An earlier idea to head back to Crimpiau was abandoned for a steady descent to the A5 and a short road walk back to Capel Curig, with ‘Mist’ giving me the look that said it was well past her dinner time! This looked like a fun hike! I really love the lake trail, very beautiful. Slippery mountain of the witch… Yes, great name for a mountain! It was a great day out Plant Girl – the outward stretch was a real skyline route with big skies (well, by our smaller UK standards!) and the return by the lake was a delight. The light was a bit hazy for photography, but some of the images weren’t too bad. It’s funny, Tilly is absolutely fine with sheep, but as soon as she hears a lamb cry, she goes totally daft….so this time of year it just has to be the lead if there’s any lambs about. Dogs can be such strange creatures at times, but we wouldn’t be without them. Some pretty spectacular views on that walk Paul. A friend of ours was just relating a lamb based story to us. 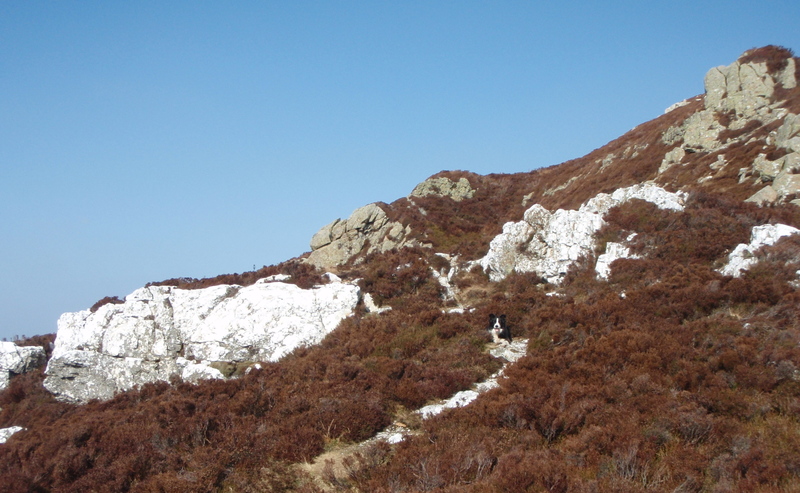 She wasted quite a bit of time on the weekend’s Rab Mini Mountain Marathon because the pitiful bleat of a lone lost lamb was just impossible to ignore. She ended up carrying it until luckily the rest of the flock, including it’s mother, were located. Interspecies co-operation! I notice that she and her partner still managed to score the most points in their class! Cracking route Carol – Craig Wen is a complex little summit, but I gave it a miss on this trip.